TRICONE DRILL BITS : HOW TO READ THE IADC CODES ? IADC is The International Association of Drilling Contractors. Since 1940, the International Association of Drilling Contractors (IADC) has exclusively represented the worldwide oil and gas drilling industry. IADC’s mission is to promote drilling and completion technology; improve industry health, safety, environmental and training practices; and champion sensible regulations and legislation which help safe and efficient drilling. 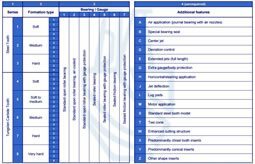 The International Association of Drilling Contractors came up with a system to describe any tricone bit through a simple 4 digit number. This streamlines the process of ordering a new tricone bit for drillers everywhere. By coming up with a simple 4 digit code to describe and categorize any tricone bit they eliminated any confusion that can arise when ordering. 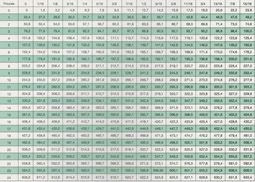 This classification system dedicates the first 3 digits to the design and function of the tricone, with the final digit being an alphabetical code for any additional features of the bit. Every drill bit is designed for a certain type of rock formation, ranked according to hardness. 1, 2 and 3: Indicate a steel tooth. 1 is engineered for soft rock formations, 2 for medium formations, and 3 for hard formations. 4, 5, 6, 7, and 8: Indicates a tungsten carbide insert (TCI). Regardless of tooth type, the second digit takes into account all factors of the bit and ranks the rock formations the drilling tool is best suited for on a scale from 1 to 4. 1 represents soft formations going up to 4 representing the hardest formations. For Example, Tricone bits use different bearings depending on the type of material to be drilled. 1, 2 and 3: are for roller bearings. 1 is for standard roller bearings, 2 is for air cooled bearings, and 3 is for open bearing with gauge protection. 4 and 5: sealed roller bearings. 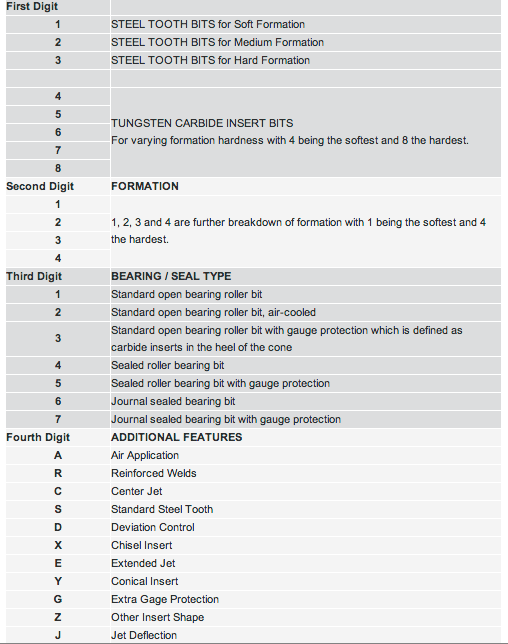 4 is for standard sealed roller bearings, and 5 is for a sealed roller bearing with gauge protection. 6 and 7: sealed journal bearings. 6 is for a standard sealed journal bearing, and 7 is for a sealed journal bearing with gauge protection. The fourth digit is a letter indicating the special properties of the drilling tool. I am a tricone products designer in a reputed MNC company. I would like to know is there any standard way of designing the cutting structure for tricone products as per IADC codes. Do we have any reference or standard to design a tricone bit for a particular rock formation and as per IADC codes? This is Akrami and our company need to buying 20-50 Rock Bits PDC 17 1/2″ Please send me your offer and everything related to the business.